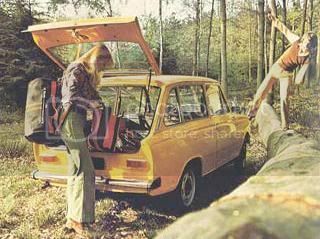 In its last year in production, the DAF 46 is once again unchanged, though it has to be noted that the panel van is no longer offered. It is the very last automobile to bear the DAF name, as the 66 (basically the same car fitted with a four-cylinder engine of Renault origins) is now produced under the Volvo brand. ● Introduction: September 1966 as the 44, October 1974 as the updated 46. Construction: unibody. Engine: air-cooled flat two, 0.85-litre, 40 hp, mounted at the front. Transmission: to the rear wheels through a continuous variable-speed gearbox. Suspension: independent on all four wheels. Brakes: hydraulic, to drums on all four wheels. Length: 388 cm. Top speed: 125 kph. Range: two-door “Luxe” saloon, two-door “Super Luxe” saloon, two-door “Combi Luxe” estate, two-door “Combi Super Luxe” estate. Click here to return to a list of all DAF vehicles presented on this blog.